Buffalo resident Jonathan Bottoms celebrates after crossing the finish line inside Selby Stadium during last year’s IRONMAN 70.3 Ohio. 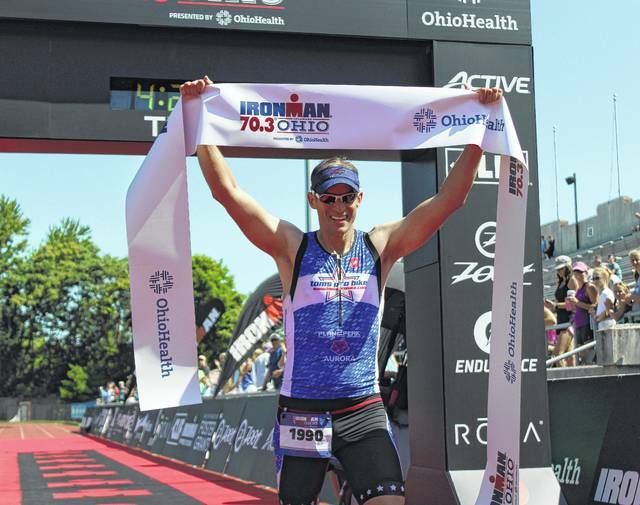 There will be a new champion crowned at the IRONMAN 70.3 Ohio triathlon Sunday. Out of about 2,400 registered for the third year of the event held in Delaware, one name is unfortunately not on the list. Dublin-native Michael Vulanich and current San Francisco resident who ran the fastest times in each of the first two races with times of 4:12:53 and 4:06:08 respectively, broke his foot in training and is unable to compete this time around. “I really enjoyed coming home the past two years to race where I was raised – and winning was a nice cherry on top,” Vulanich said via email. Angela Quick, a native of Canada, finished with a time of 4:39:36 to win the 2016 race, and Peggy Yetman won last year’s event with a time of 4:30:00. This is the third year hosting the event for Delaware and Ohio Wesleyan University, which has 30 qualifying spots to the 2019 IRONMAN 70.3 World Championship Sept. 8-9, 2019, in Nice, France. Ohio Wesleyan is hosting a three-day event surrounding the race at Selby Stadium. The IRONMAN village and store as well as information and athlete check-in tents will be up and running Friday through Sunday. The Ironkids fun run is Saturday at 9 a.m. at Selby Stadium, and it all leads up to the race itself, which starts Sunday at 7 a.m. All of it is open to the public. Taylor views the event as a way for people to see OWU that might not have had an opportunity see it otherwise. “It’s an opportunity for everyone to rally together and show off our city,” Taylor said. “It’s obviously a great opportunity to bring such an event to campus and to showcase the facilities at the college. As for the details surrounding the IRONMAN 70.3 Ohio triathlon, the swimming course is 1.2 miles and will take place in Delaware Lake. It is a triangular course that begins and ends on the Delaware State Park’s beach with two right-hand turns – a change from previous years. The biking leg of the race is a 56-mile course that is mostly flat, fast and straight, topping out at 450 feet of elevation. The course starts at the state park, heads north on U.S. Route 23 to state Route 98. Racers will turn right at state Route 309, where the race will reach its northern-most point in Marion County then come back south on state Route 746 and U.S. Route 42, before continuing through Delaware where it will end at OWU’s Selby Stadium. The running portion of the race is 13.1 miles starting at the stadium. Runners will head south on South Henry Street, turning left on Olentangy Avenue and right on Pollack Road. A right turn on Kingsbury Road begins the first of two loops along Berlin Station Road, Braumiller Road and Pollack Road, before heading back to the finish line at Selby Stadium. Hammond said they need volunteers – adding that they’re down to about 500 to 600 volunteers from an estimated 1,400 last year. https://www.delgazette.com/wp-content/uploads/sites/40/2018/07/web1_bottoms.jpgBuffalo resident Jonathan Bottoms celebrates after crossing the finish line inside Selby Stadium during last year’s IRONMAN 70.3 Ohio.